"Sonic Meditations is proud to present the 2006 heavy drone suite Center of the Earth by Expo '70. This four part suite is presented on deluxe 180 gram audiophile virgin vinyl housed in gatefold tip-on jackets. Mastered for vinyl by Pete Lyman of Infrasonic Sound. Justin Wright's Expo '70 has been gaining momentum over the years, having started with self-released CDr's, Wright has made a name across the globe for Expo '70. 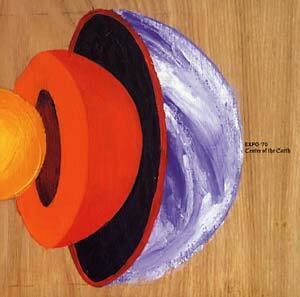 Center of the Earth was recorded over 3 days in 2006, released by Wright himself, the album sold over 650 CDr's. Wright also re-released Center of the Earth last year on his start-up label, Sonic Meditations in a edition of 200 cassette tapes, which quickly sold out. Now Wright is issuing this epic drone album on vinyl, the heavily low-end drenched drone suite will sprawl across 2 180 gram LPs. Due to the length of track 3, it will sprawl across from side C to D. Expo '70 has releases on Beta-lactum Ring, Dead Pilot, Kill Shaman, Peaant Magik, Sloow Tapes and Reverb Worship, just to name a few."